June is bustin' out all over Long Island and summer will be here soon, which means lots of refreshing summer ales and fun summer festivals. Congratulations to Six Harbors Brewing Company in Huntington on the opening of their new tasting room in May, becoming the 32nd craft brewery tasting room or brewpub on Long Island. We are looking forward this summer to more openings of brewery tasting rooms in Riverhead, Bay Shore and Westhampton Beach. Check out our comprehensive lists of Brewery Tasting Rooms and Brewpubs on LIBeerGuide.com. Long Island Craft Beer Week ran this year from May 11-20 with dozens of fun events held across LI. 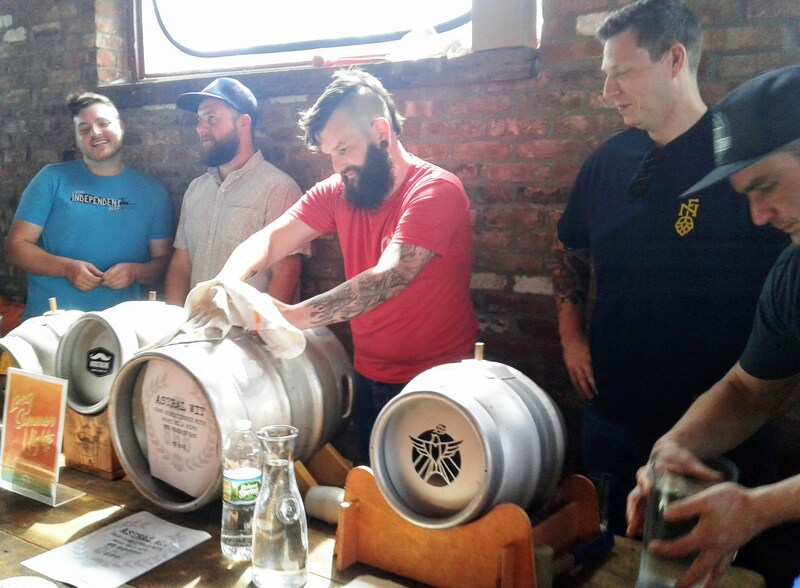 Among the highlights were two Cask Ale Festivals, with the first on May 11 at That Meetball Place in Farmingdale featuring cask ales from Suffolk County breweries. The second Cask Ales Festival was held on May 18 at L.I. Pour House in Port Jeff Station, featuring cask ales mostly from Nassau County breweries. Craft beer lovers also got to meet and greet brewers at Town Takeovers in Farmingdale on May 12 and Patchogue on May 19. 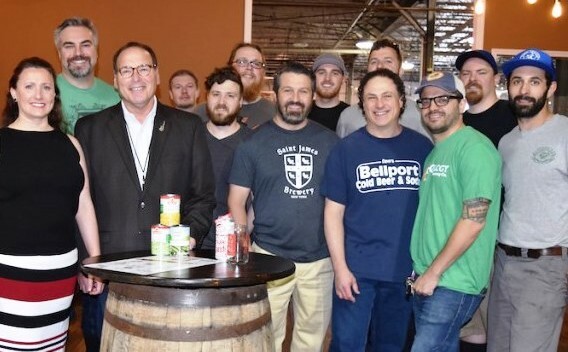 Long Island Craft Beer Week's “Can for a Can” food drive, which benefits Long Island Cares/Harry Chapin Food Bank, is still going on until June 9 at participating locations. Depending on availability, you can pick up a can of this year's special Craft Cares collaboration beer, Bi-Coastal IPA, by donating three cans of food. The “Can for a Can” drive hopes to raise more than 5,000 pounds of food this year. 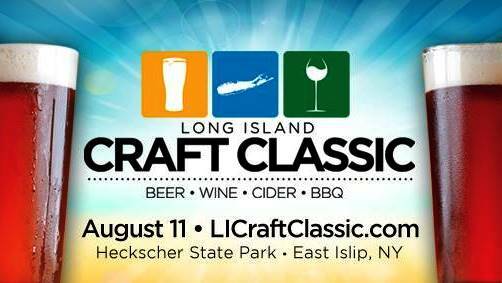 More information and a list of participating locations is available at www.licbw.us. Moustache Brewing Co. in Riverhead recently joined 1% for the Planet, a global organization that connects companies and non-profit environmental organizations. Moustache has pledged to donate 1% of sales of their New York State farm beers to local environmental groups. 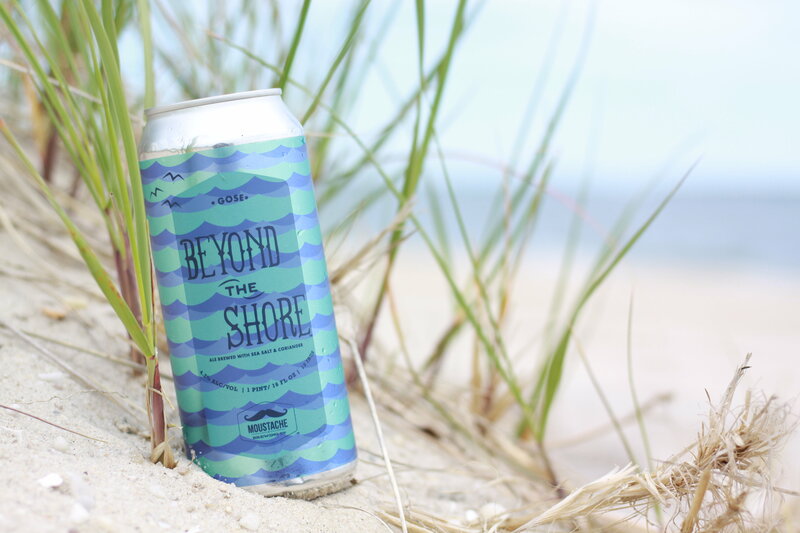 On June 1, the brewery released Beyond The Shore, a gose brewed with sea salt and coriander, which is the first beer brewed for their 1% for the Planet commitment, benefiting the non-profit Shinnecock Bay Restoration Program. Lauri Spitz, founder of Moustache Brewing with her husband Matt, said, “It’s important to us to make positive changes in the world around us while inspiring others to do the same. Joining 1% For The Planet will allow us to strengthen our commitment to the environment and support the work of our charity partners.” Moustache is currently finishing up work on an expansion that will quadruple the size of its brewery and tasting room. Other Long Island breweries are involved in environmental causes, including Blue Point Brewing in Patchogue. In 2017, Blue Point partnered with Save the Great South Bay Inc., a non-profit organization dedicated to the revitalization of The Great South Bay. Blue Point brewed a special beer, Drink the Bay Clean India Pale Lager, with proceeds going towards supporting Save the Great South Bay's Creek Defender Program. 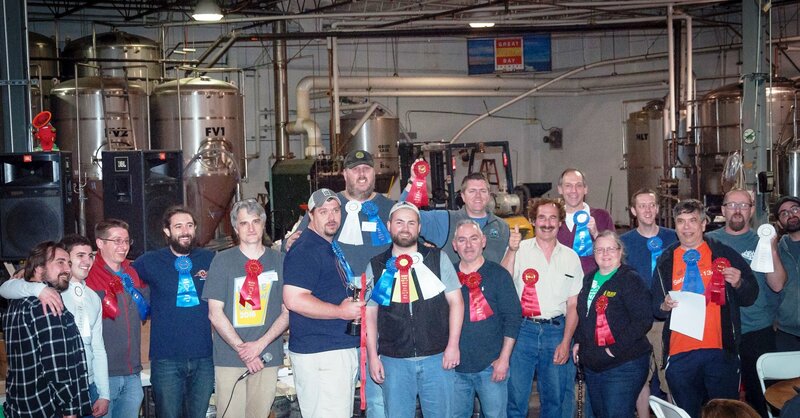 Brewers East End Revival (B.E.E.R), Long Island's oldest homebrew club, held its 22nd annual Brew-Off Homebrew Competition on May 12 at Great South Bay Brewery. 193 entries were judged from over 40 styles of beer and cider. The winner of the Best of Show Award went to Josh Youngman of Hudson Valley Homebrewers for his International Pale Lager. The Pete Algerio Memorial Cup for best stout brewed by a B.E.E.R. member went to Justin Hansen and Mark WIlliams, and the Brewers Cup for best beer brewed by a B.E.E.R. member was won by Jonathan and Nassia Spanos for their Snowbeerd wood-aged beer. Snowbeerd will be brewed later this year at Black Forest Brew Haus in Farmingdale. Long Island Beer & Malt Enthusiasts (LIBME) homebrew club brewed a collaboration beer with Long Ireland Beer Company in Riverhead, a classic German springtime style called Helles Bock or Maibock. The beer, named "Not in Mai Bock Yard," was released at Long Ireland on May 26 and is now available on tap at several beer stores and beer bars. Beer stores selling growlers include Bellport Cold Beer & Soda and Swiftway Beer in Medford, and beer bars serving the collaboration brew include Tap & Barrel in Smithtown, The Villager in Babylon, O’Hara’s Ale House in Port Washington, and Craft @ C’est Cheese in Port Jefferson. LIBME will hold its next monthly meeting on June 6 at Brewers Collective Beer Company in Bay Shore and new members are always welcome. The members of Handgrenades Homebrew Club (Brewgrenades) were saddened in May to learn of the upcoming closing of their namesake homebrew shop in Baldwin. Peter Tripp founded the Homebrews & Handgrenades shop in 2013 and was a founding member of the Brewgrenades club in 2014. He hosted monthly bottle swaps at the shop and was a regular presence at club meetings and festivals. 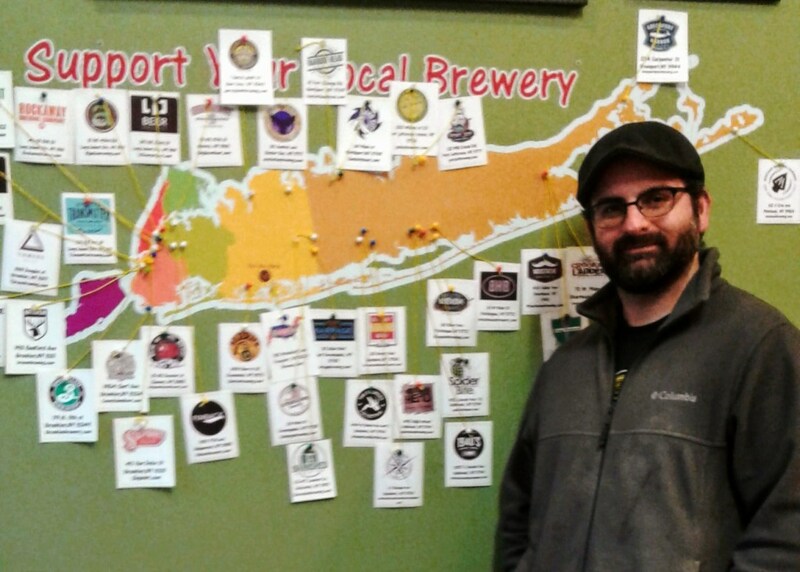 Peter has decided to pursue other opportunities in the craft beer industry and all club members and the Long Island homebrewing community wish him much success. Homebrews & Handgrenades will close on June 16 and Peter will be running closeout specials until then, with details available on the shop's Facebook page. The Brewgrenades club will continue to hold monthly meetings at beer bars and breweries in Nassau County, with the next meeting on June 19 at Barrier Brewing Co. in Oceanside. The Beer Garden, Freeport - this outdoor beer garden opened in May near the head of the canal at Freeport's Nautical Mile. Owned by the same team behind Black Sheep Ale House in Mineola, The Beer Garden offers a dozen beers on tap including seasonal local brews, along with a menu with inventive takes on pub favorites like burgers, brats and hot dogs including kobe and Chicago-style dogs. The Beer Garden will soon have a companion year-round gastropub, The Craft House, located across the street in the space formerly occupied by Cleary's on the Water. Barn Door 49, Bay Shore - new American gastropub on W. Main Street located near the YMCA Boulton Center for the Performing Arts. 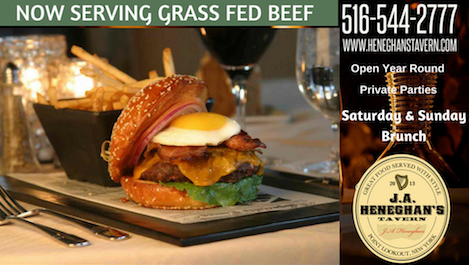 Farm to table menu with 12 craft beers on tap.